The conquering armies of ancient times tended to ransack the city rather than endow it with artistic treasures, but all that changed with the Byzantines, who adorned their churches and palaces with mosaics and frescoes. Miraculously, many of these remain. Their successors, the Ottomans, were quick to launch an ambitious building program and the magnificently decorated imperial mosques that resulted are architectural triumphs that together form one of the world's great skylines. In recent years, local banks and business dynasties have reprised the Ottomans' grand ambitions and endowed an impressive array of galleries, museums and festivals for all to enjoy. With that being said, the Istanbul Half Marathon is the place to be!! 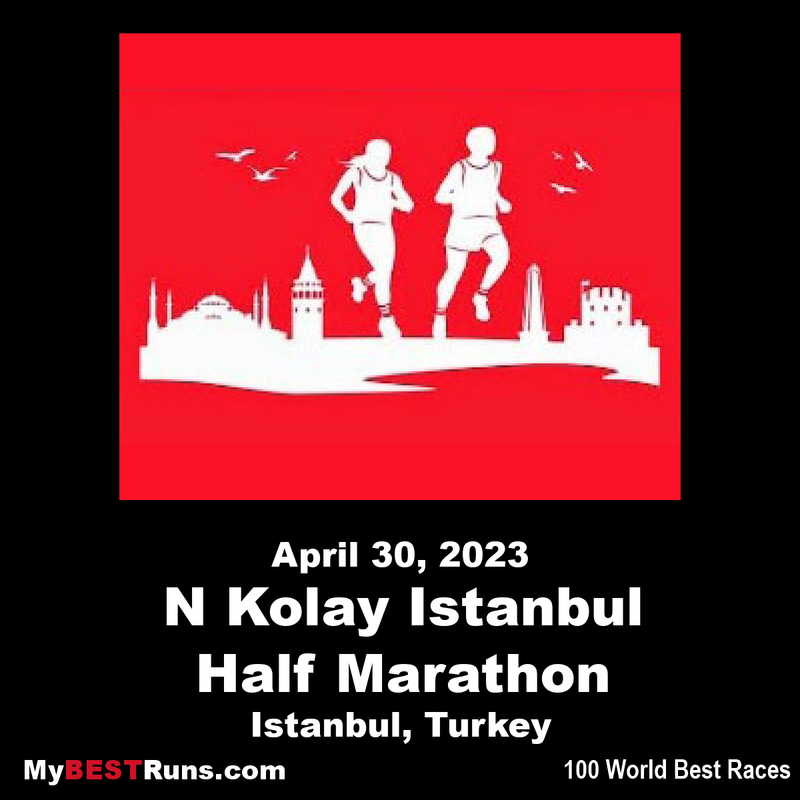 The Istanbul Half Marathon (Turkish: İstanbul Yarı Maratonu) is an annual road running event over the half marathon distance (21.1 km) that takes place in April on the streets of Istanbul, Turkey. It is now a IAAF Gold Label event. (2018) Istanbul Vodafone 13th Istanbul Half Marathon organized by Istanbul Metropolitan Municipality Sports Istanbul was held in the Historical Peninsula. The organization ranked among the best 11 semi-marathons in the world and placed in the Golden Category,8,000 athletes from more than 50 countries ran for a healthier life. Ethiopia’s Amdework Walelegn stormed to a Turkish all-comers record on Sunday (8) at the Vodafone Istanbul Half Marathon, an IAAF Gold Label road race, clocking a personal best of 59:50 in his second appearance over the distance. Walelegn, who turned 19 last month, arrived in Istanbul with a modest 1:02:00 lifetime best, a time he ran in his half marathon debut in Riyadh in February. However, he had proved that more was coming when he finished in a world-leading time of 27:36 at the Laredo 10km three weeks ago. The Ethiopian talent was in the leading pack going hard from the gun. The fast opening 2:43 kilometre led to a 14:10 split at five kilometres with an 11-man pack at the front. 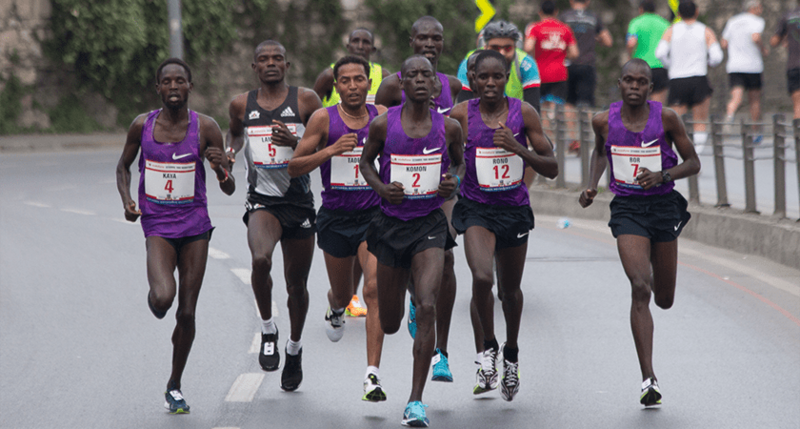 Along with Walelegn, Asefa Tefera of Ethiopia, Kenyans Leonard Langat and Evans Cheruiyot, and the Turkish duo Kaan Kigen Özbilen and Polat Kemboi Arıkan were still in contention when the group passed the 10-kilometre mark in 28:09. Arikan was the first to start losing ground after the 12th kilometre, but the rest held together at 15-k, reached in 42:15 and still well in line with the targeted pace of sub-60. Strong head winds after the turn-point at 16 kilometres slowed the pace a bit but Walelegn coped best with the conditions and pulled away from the others to hit 20 kilometres in 56:42, 50 metres ahead of Tefera and 70 metres ahead of Özbilen. The gap increased over the final kilometre with the young Ethiopian crossing the finish line in 59:50, the first sub-60 on Turkish soil. Tefera was second in 1:00:07 with Özbilen, who finished ninth at the IAAF/Trinidad Alfonso World Half Marathon Championships Valencia 2018 two weeks ago, followed in a national record of 1:00:08. Ababel Yeshaneh achieved the second victory of the day for Ethiopia, taking the women’s title after slicing nearly a minute from her career best. Yeshaneh, her compatriot Roza Dereje Bekele, the winner of Dubai Standard Chartered Marathon in 2:19:17 in January, and Kenya’s Diana Kipyokei were in a distant lead at 10 kilometres where they passed in 31:11. Yeshaneh made her move and created a gap over the two after the 15th kilometre and reached the finish alone in 1:06:22. Dereje arrived second in 1:07:00, with Kipyokei third in 1:07:55, PBs for both. Half Marathon 21K Route; The races starting from Yenikapi will continue from the beach to Kumkapi, the lights in front of the Sirkeci caravagin ferry pier and will return from the lights. The race will return from the coast road to Zeytinburnu veliefendi turnout and it will return from Ottomare Palace in front of 300 meters before departure and it will be at Yenikapı Ride area where it started. Seas and land have divided the lacework geography of Istanbul into four pieces. Old Istanbul City and Galata in the shores of Golden Horn and previously different village now united residential districts are located along the straits of Bosphorus. As the smallest sea of the world, inhabited places along the shores of Marmara Sea shows the magnitude that the city has reached. The Old City is spread over the seven hills of the triangular peninsular surrounding it with 22km of city walls. This is a historical settlement area called Byzantine, New or Second Roman Empire, Constantinople or Polis over the years. Marmara and Golden Horn city wall partially vanished over time; the actual landside city walls, however, have relatively survived till today. Larger west side of triangular peninsular is landside city walls, two other sides are sea-side city walls and cape side on the east is the sea shore of Topkapi Palace. This is the first, the widest and the longest of all seven hills. The palace is like a city within the city, surrounded by city walls, forming a sophisticated structure that exhibits very important and unique works. Two unique places of festive days, Aya Irini (Haghia Irene) and Istanbul Archeology Museum – also an important and unique structure of its kind –, are positioned in the first courtyard of the palace. 8th wonder of world Aya Sofya Museum, as much famous as its beauty Sultan Ahmet Mosque, Roman Hippodrome, Yerebatan Palace Basilica are place on the plain of the first hill. Second hill is the place of the oldest and the biggest “Kapali Carsi / Covered Bazaar”. Nuruosmaniye Mosque and the remaining gift from Roman capital city times - Cemberlitas Pillar - are located here. While Suleymaniye Mosque is placed on the third and Fatih Mosque on the fourth hill of Istanbul, an aqueduct from the Roman times stretches between the two hills. Sehzade Camii and Istanbul Metropolitan Municipality building are placed here. Providing the water supply of the city in old times, gigantic Roman time open-air water basilicas are place in higher hills. Sultan Selim Mosque on the fifth and Kariye Museum are on sixth hill’s slopes. Passing over the tops of those hills, starting from Ayasofya square, reaching to the gates by branching out, the roads follow the Roman route. Marking the territory on the west, three-row fortified landside city walls are splendiferous examples of Roman military architecture. The city walls reach out to Eyup-Golden Horn (Halic) in the north. Giving its name to the hosting district, Eyup Sultan Camii is known to be the first mosque built in the city. Golden Horn (Halic) is a bay with 8km. length, narrow, curly as a horn. Unique and magnificent city silhouette of Istanbul can best be enjoyed from sea, from the sea shores of Asian side and from the ferries departing at the entrance of Golden Horn (Halic). Cleansing of Golden Horn is done long ago, fishes returned, enriched with surrounding parks and garden, awaiting the remnants of the old dockyard to be removed. Orthodox Patriarchate and tiny Bulgarian Church are connected to the other side with the old Galata Bridge. Newly established privately owned by Koc family, Koc Museum exhibits interesting objects. Golden Horn has acquired a new sightseeing destination with the machete park, called Miniaturk, holding miniatures of renowned architectures of Turkey. Galata district and its Beyoglu (Pera) extension carries a significantly different outlook than the old city. Symbolized by Galata Tower, with its uphill roads reaching up Beyoglu, this neighborhood carries and preserves the features of architecture, built under the influence of age-old European architecture. Second oldest subway of Europe, Tunel, still preserves the title of ‘shortest subway’. Upper end of the Tunel is the beginning of İstiklal Street. Apart from reinstalled old tram, it is a pedestrian-only street, surrounded by consulate buildings allocated in early times. Divan Literature Museum is in the Mevlevi Tekkesi (a building for rituals of a Sufi order built in 18th century). In the midst of the street, famous Galatasaray High School is located just across Cicek Passage with its colorful, authentic restaurants, fish and fruit markets. With all the cinemas, theaters, cafes, restaurants and entertainment centers, line up to the Taksim square, İstiklal Street has joined its longed lively, crowded days and nights. Symbolizing Kurtuluş Savaşı(Salvation War), Ataturk and his friends, embellishes Taksim Square as a monument. Main terminal of new metro subway is placed under Taksim Square and Ataturk Culture Center is located in the north of it. Five-star Hyatt and Intercontinental Hotels are in the Taksim park. Being the first in its category in Turkey and preserving it still, Istanbul Hilton Hotel (1955) is also lined up in the same place. Radio House, Istanbul Military Museum with its rich and unique content, Lutfi Kirdar Congress Palace and Open-air Theater are located around this quarter. Toward the north, Nisantasi and Sisli are positioned decorated with small boutiques, painting and art galleries, dynamic as ever. To the further north, along the Buyukdere Street and Etiler, plazas, modern shopping malls provide new opportunities to the people of Istanbul and its guests. Sky-rise buildings, rising up in this quarter, certainly, give some diversity to the silhouette of the city. Enjoying the magnificent view of Suleymaniye Mosques from renovated Galata Bridge is priceless. Valide Mosque and Egyptian Bazaar are just across the bridge. Initially built for spice merchants, with its 100 shops, it is the second largest and crowded place of the city. Shops range from spices, dried fruits to various goods inside and fish, flower and fruit shop outside. Ports in the both sides of the bridge are the starting point of regular domestic ferry lines to the Asian shores, Uskudar, Kadikoy, Bosphorus and the Islands. Fish and bread sold in the small boats go best with the scenery of Istanbul’s straits and become source of inspiration for poems and songs. Living up with the old grandeur of the days of Orient Express, Sirkeci Train Station impatiently awaits to embrace the revitalization of its old days with the near-complete Marmaray Project. While Sepetciler Mansion serves the members of international press, the road going up in front of Sirkeci Train Station to the Istanbul Governorship, called Bab-i Ali Hill, is an important historical street. The port, stretching out between Tophane and Galata Bridge, is reserved for tourist cruisers. With the cruises starting in April and ending in October, millions of tourists visit Istanbul. Tophane building has been redecorated as a gallery serving to the art life of the city. Further up of this quarter is adorned by Dolmabahce Palace and mosque, shining like a jewellery box in the shores of Bosphorus Straits. Right behind the palace, another five-star hotel, Swiss Hotel, rises. From this point, the beauty of Uskudar and Camlica hills in the shore and Topkapi Palace and Ayasofya in the west can be witnessed. Bosphorus straits are extended to Black Sea as a curly river, its 30km length can only be seen from an airplane; in its shores holds a view of a lake in every turn from the cape. Sea shores are embellished with palaces, mosque, sea side mansions, giving their color reflected to the sea. The Old City Walls and two suspension bridges witness this beauty of nature. White seagulls follow white ferries. While yachts and ships run down in the dark blue waters, a huge tanker appearing like a black ghost bringing its dangerous load from Black Sea may try to pass this unique beauty passage by threats. Intermingling with the shine in the night, the north part of the Bosphorus is coated more with the green. Based in the north part of Anatolian side, Beykoz is famous district for its natural beauties where green and blue shades dance in harmony. Historic Oncesmeler, Beykoz Mosque, Beykoz Small Forest, Beykoz Park, Beykoz Turkish Bath, Beykoz Nursery Garden and historical wooden houses with their narrow ornamented streets are among the first to be mentioned. Besides, Anadolu Castle, Kucuksu Mansion, Yoros Castle in Anadolu Kavagi, Tomb of the Prophet Yusa who live during the time of Prophet Moses are located within the boundaries of Beykoz district. Right across Beykoz are Istinye, Yenikoy, Tarabya and Sariyer quarters are other natural beauty attractions of Bosphorus Straits to live in. Uskudar is the last stop of roads coming from Asia and ending here. Being the shortest passage to Europe, Uskudar is very richly decorated with beautiful mosques. Roads leading up to Camlica hills are covered with trees and with old-new tombs; Buyuk Camlica Hill is the best excursion spot for enjoying the view of Istanbul from a higher point. Through the roads along the shore, Kiz Kulesi (Maiden’s Tower) and Istanbul Peninsular stand out with all their majestic and reach at Kadikoy. The city’s biggest and oldest building in Selimiye Kislasi (Selimiye Barracks), also known as Florence Nightingale Hospital in international arena and Haydarpasa Train Station built in Prussian architectural style are characteristic buildings of the district. Along the sea shores of the city, the commercial port facilities are extended. Kadikoy is known as one of first inhabitation fields in the mythology. Typical bazaar, beautiful Moda beach, Fenerbahce Park, marina, famous Bagdat Street makes it one of the calm quarters. Losing old mansions with beautiful gardens to the new construction trend, the city accommodates the most modern and biggest shopping centers. The Islands District still preserves its status to be among the first summer resorts. Although traveling to The Islands fastened with the speedy ferries, only medium of travel on the island is phaetons (carriages pulled by horses). Summer mansions, well-cared gardens are close by to the ports. Main attraction points of the spring and summer seasons become deserted places coated with pinewoods in the winter season. Every season has its own beauty. The Islands District is the ultimate destination for weekend picnics, swimming and yachters. Istanbul is Europe’s third and world’s 21st biggest city. As researches demonstrates, if these trends continue, Istanbul will be the most crowded city of Europe by 2020. Despite its population of more than 12 million people as well as the mass of visitors coming from various different countries, the city is enlisted among the safest cities in the world despite its highly dense population. This gives a sense of peace to citizens and visitors alike as the city’s historical heritage carries them through the ages. According to the available data, one of every 66 people in Istanbul is involved in a crime. This is compared to one of 14 people in Budapest, one of seven people in Vienna, one of eight people in Luxembourg, one of 34 people in Sofia, and one of six people in Berlin. The research conducted by the EU Crime and Security Consortium, exposes however that 18% of people in Istanbul become victoms of a crime as compared to 32% in London, 27% in Amsterdam, 26% in Belfast and Dublin, 24% in Copenhagen, 23% in New York and Stockholm, 20% in Brussels, 19% in Rome. While total public crimes were recored as 148,165 in 2005 in Istanbul, there were 262,176 in Berlin, 1,015,121 in London, and 200,177 in Paris. Crime rates in Istanbul, however, have been considerably lowered during the past three years as the result of successful operations by law enforcement units and by the use of MOBESE (acronym for Integrated Mobile Electronic System of CCTV). When compared with the first four months of 2007-2008, there has been a decline of 21% in general crimes, 38% in homicide, swindling, and 59% in pick-pocketing. MOBESE is a “City Information and Security System” enacted under the Istanbul Security Department with the support of Istanbul’s Governorship. With the 584 modern cameras installed in several of Istanbul’s streets and squares with the aim of enhancing public services, facilitating administrative functions, and further decreasing crime rates. Twelve different systems, including 952 quarters, 3,500 police vehicles, 150 mobile police station units, the foundation of Province and District Command Centers, and City Security Directorate, were integrated with MOBESE. Starting with the emergency services, the other institutions are planned to be integrated into the system as necessary.